Kieron Lloyd J. Minto St Aimie. What a name! What a player? No. Not yet. Possibly not ever. 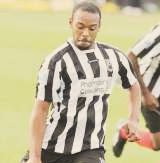 I first saw KSA in a Maidenhead United shirt during a pre-season friendly at Holyport in July 2009. A quick Google search, when I got back from the game, indicated that he had started out as a highly-rated youngster at QPR (apparently scoring a wonder goal on debut, in a high-profile friendly with Celtic) before embarking on short and largely unproductive spells at Oxford United (loan), Barnet, Grays Athletic (loan), Stevenage Borough (loan), Lewes (loan), Thurrock and Hitchin Town. Prior to joining the Magpies, the club he'd made the most appearances for was Barnet (13 games, according to the ever-reliable Wikipedia). While he didn't really stand out against Holyport (unlike Dereck Brown's son, Daniel, for example) he was signed by Drax and featured regularly throughout last season (sometimes out wide, or in central midfield, but often upfront), chipping in with some valuable goals. He was, though, a frustrating player. Despite having seemingly all the desired attributes (tall, quick, decent touch etc. ), he often appeared lazy - as if going through the motions - and lacked a killer instinct. I vividly recall the match-up at Woking in September 2009 where, in front of a 1400-plus crowd, he clearly had the beating of Cards centre half and captain Tom Hutchinson, but never took the game by the scruff of the neck, with his final ball/ shot seldom hitting the mark. Obviously I haven't seen much of him this season, but I have read and heard that the 'flatter-to-deceive' performances have continued. Still, it was something of a surprise to learn today that he has been released by the club. It was clear to me, at least, prior to the season that we were going to struggle for goals and, with Cliff Akurang recently having departed for table-topping Braintree Town, Sam Collins lacking fitness and form and so loaned to Hornchurch, the ill-disciplined and raw Alex Wall about to begin another suspension, and the hardly-prolific-at-the-best-of-times Kieran Knight getting (presumably) ever slower, I'm not sure that the shipping out of KSA is going to help matters. I suppose his departure frees up a bit of the budget for another striker (a hard-working one, who is a more consistent goal threat), but how much is debatable. As for KSA and his future, I think there are parallels with another ex Magpie striker: Richard Pacquette. Like St Aimie, Pacquette has all the physical attributes and was a promising youth prospect, who didn't quite make the grade at QPR (for whatever reason). Pacquette's descent down the football pyramid, following his departure from Loftus Road, took in a whole host of clubs: from Stevenage and Thurrock, like St Aimie, to Hampton & Richmond Borough and Worthing. Somewhere along the line I suspect Pacquette had a 'eureka' moment, when it dawned on him that he was no longer the hot-shot young striker who could coast through games, relying on natural talent and instinct to get the goals and the glory; instead, he would have to knuckle down and work hard for himself and for his teammates ... or risk wasting his footballing abilities. After successful spells at Havant & Waterlooville (where he scored at Anfield in the FA Cup) and at York Road (he initially joined MUFC on loan to help stave off relegation, before firing us towards the play-offs the following campaign, dominating the end-of-season awards), Pacquette made it back to the Conference (with Histon, then York City, and currently Eastbourne Borough). While the national league may be slightly too high a level for him, he was easily one of the best strikers in the Conference South during his time with the Magpies (forming a truly formidable partnership with Mustafa Tiryaki towards the end); a Hampton supporter I spoke to, for example, simply couldn't believe that he was the same player who had laboured upfront for them, three years or so previously, the turnaround in his effort and application being so marked. Hopefully KSA will have his own Pacquette-like 'eureka' moment sometime soon. If so, I would expect him to be scoring goals galore in the Conference South (and possibly above) not long thereafter. He's only 21, so time is certainly on his side. I briefly spoke with him once, during the halftime interval of our pre-season friendly at Burnham last summer, and he seemed like a decent bloke (if somewhat shy and introverted; perhaps a lack of self-confidence might explain his inconsistent play?). As such, I wish him all the best.